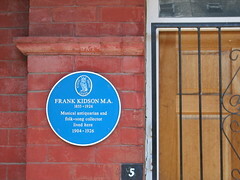 One of the blue plaques in Chapeltown is “Frank Kidson M.A. 1855-1926 Musical antiquarian and folk-song collector lived here 1904-1926“. Frank Kidson was a co-founder of the Folk-Song Society. Are icecream vans folk music? What other forms of folk music are catalogued in Chapeltown homes? I like bread as a universal symbol for humanity. I think there is something bread-like in almost all cultures. My original thought on this was that bread should be the illustration on all Euro bank notes, with each country choosing bread examples for each denomination. ‘Bread’, ‘dough’ – get it. Collecting recipes also seems a good way of documenting community. Sculptures of fictional characters appeal to me. The art piece I saw a while back comes to mind where the funding was spent to slightly sink some of the paving stones in a town to create a puddle when it rains. But the artist kept the location of the ‘art puddle’ a secret, so that every puddle was a contender. I can’t remember much about who made this. Anyone know? I find it interesting how often ‘invasive species’ are described in terms of a particular country of origin – like the country is to blame. Japanese knotweed, Africanized killer bees, giant American toad, European green crab, Indian mongoose, Argentine ant, Dutch elm disease, Mozambique tilapia, English starling, West Indian stinging ant, etc.. Classic fear-based flood metaphors (normally seen in the pages of the Daily Mail describing immigration) are also often used to describe wildlife. I consider myself part of one of many Chapeltown emigre communities. The Brooklyn Mobile project from Dan Paluska is good. A straight-to-youtube recording device for use on the streets. I like this idea of 3D printing residents of a location too “Honey I Shrunk the Red Hook” is a collaboration between Luis Blackaller and Andy Cavatorta.